OMG! Kittens slot machine is a game from WMS that would probably win the prize for the cutest slot at any mobile casino, due to its kitten images and great names. The mobile slot has a RTP of 95.95 so a pretty decent payback, and there is a fantastic bonus rewarding cat loving punters with up to 45 free spins and a huge 10x multiplier. So if you love cats, and also love massive bonus rounds, check out the full OMG! 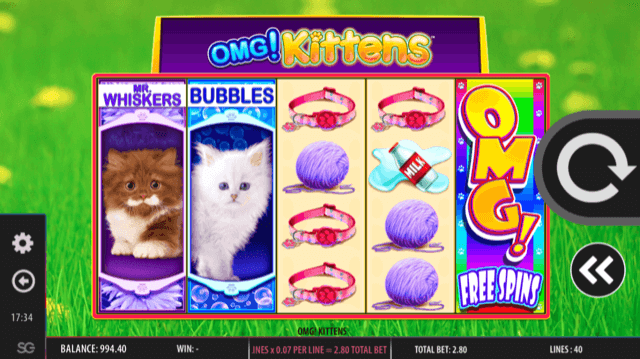 Kittens slot review. While there are definitely a lot of animal themed slots out there, none is perhaps quite as cute as the OMG! Kittens slot – a furry five-reel game from WMS that comes with its own unique bonus feature system. Featuring 40-paylines and stacked symbols on all base game reels, OMG! Kittens stars three cute kitties as its leading characters – Tiger, Bubbles and Mr Whiskers – while a cat pawing at a fish bowl, spilt milk, a ball of yarn and a decorative collar complete the line-up of unique symbols. Action takes place in front of a grassy background, while a range of mewing sound effects complete the ambience. Playable from as little as £0.40 per spin, the OMG! Kittens slot machine can be enjoyed across all desktop, mobile and tablet devices and comes with a top base game jackpot of 250x players’ bet per line amount. Additionally, all five-kitten combinations can receive a 100x prize boost should one of the pussycat protagonists land on the fifth reel, creating plenty of scope for potentially massive base game payouts. The star attraction in OMG! Kittens is the free spins feature – and although it’s a little hard to trigger, the results will invariably be worth it. Essentially, to activate the bonus, players have to land one kitten symbol on reels one, two, three and four followed by the OMG! bonus icon on the fifth and final reel. Should they manage this, players will receive a prize payout, number of free spins and additional prize modifier that is dictated by the kittens used to trigger the feature. More Mr Whiskers symbols make for a bigger initial prize up to 400x, more Bubbles symbols increase their free spins allocation up to 45 and more Tiger symbols boost the free spins multiplier up to 10x, making many combinations possible. As an extra added incentive, OMG! Kittens also benefits from a bonus guarantee which ensures players will receive at least 10x their total bet from the feature to ensure a decent payout every single time. Don’t be fooled by cute and cuddly exterior of the OMG! Kittens slot – beneath the surface, this is actually a highly rewarding and potentially volatile slot that includes one of the best free spins features around. Like our review of the OMG! Kittens slot machine? Check out these as well…..